The early to mid-1900s was an era of advancement for technology. The Wright Brothers created the first plane, telephones became commonplace, Henry Ford mass produced cars, and radio became the center of entertainment in the home, only to quickly be replaced by television. As America entered the latter half of the 1900s, astonishing undertakings, such as Neil Armstrong landing on the moon, amazed many. All of these advancements set the stage for an era that dawned at the end of the 1900s, the information age of the internet. World War II led to the USA and other nations pursuing technological innovation to keep an edge over other nations. This led to the first computers, which were massive and took up entire rooms. Yet, many worked to shrink down computers to make them more practical. The International Business Machines corporation (IBM) succeeded in making the first practical computers in the mid-1950s. While computers had practical use for businesses and government endeavors, by the 1980s they began to have more mainstream appeal. Steve Jobs, founder of Apple, and Bill Gates, founder of Microsoft, radically reduced the size of computers and made them affordable for the average American. Jobs and Gates amassed massive personal wealth in these endeavors, each becoming billionaires by bringing practical computers to the public at large. As early back as the 1970s, the US government and American universities used systems of connected computers for defense, research, and communication endeavors. By the 1980s, the internet was formed. The World Wide Web caught on with the general public by the mid-1990s. People were using America Online, searching on Yahoo, and shopping on Amazon.com by the 1990s. This revolutionized society and economics. The impact of computers and the internet was enormous. The use of video games, satellite television, medical advancement, growth in education, and other impacts abounded. Also, global interdependence increased. The internet radically increased trade and knowledge of various areas around the world. 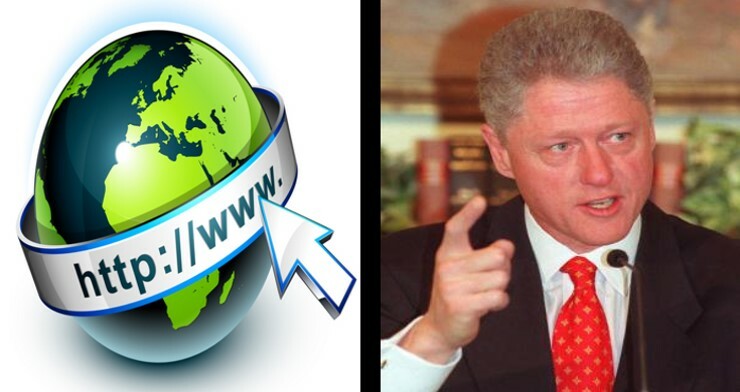 President Clinton made expanding the internet a major priority. He heavily pushed for public schools to be connected to the internet to advance education. After Clinton took office in 1992, some scandals manifested in his Presidency. One scandal dealt with Clinton supposedly making money in a corrupt way with a real-estate company, Whitewater Development Corporation, while governor of Arkansas in the 1970s and 1980s. Attorney General Janet Reno asserted no evidence implicated Clinton in the accusation. Congress asserted that the US Court of Appeals should pursue the endeavor to provide an unbiased opinion. Special prosecutor, Kenneth Starr, served to prosecute Clinton to the US Court of appeals panel formed by Congress. Kenneth Star was unable to provide evidence to implicate Clinton to the Whitewater scandal. Yet, under oath, Clinton was asked about side item issues, including accusations of an extramarital affair with a 22 year old White House intern named Monica Lewinsky. Under oath, Clinton denied the affair occurred. Yet, later, he confessed to having an inappropriate relationship with Lewinsky. Starr recommended Clinton be impeached for lying under oath. In 1998, the Republican controlled House of Representatives impeached Clinton. However, a President is only fired through impeachment if the Senate also approves the impeachment. Many Democrats argued Clinton was unethical in lying, but should not be removed from office. They also asserted Kenneth Starr was more interested in destroying Clinton’s reputation than prosecuting the Whitewater case. Many also claimed questioning Clinton about his affair, though his affair was immoral, was irrelevant to the Whitewater scandal. While the House did impeach Clinton, he was not removed from office. In 1999, the Senate did not approve of the impeachment. Clinton was acquitted and finished his second term office, despite the scandal. By the end of Clinton’s second term, the economy was thriving in the USA. There was a budget surplus, unemployment was low, and the technological revolution of the internet had changed everything. 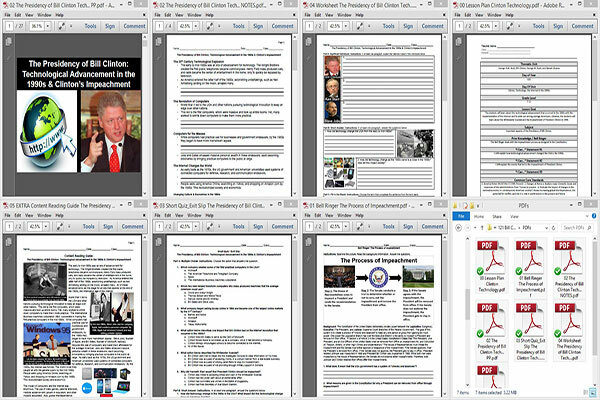 Despite the strong economy, Clinton’s scandals led to massive criticism from many in the USA. Yet, he left office with a high approval rating of 66%, the highest rating for a president since WW II. In the Election of 2000, Al Gore, Clinton’s Vice President, ran for the Presidency. He lost to Republican George W. Bush, the son of George H.W. Bush.